Last Saturday morning, Odie and I pulled into a parking area deep in the Catskills, hoping among other things for a chance to spot the Shawangunk Mountains from the summit of Indian Head Mountain. 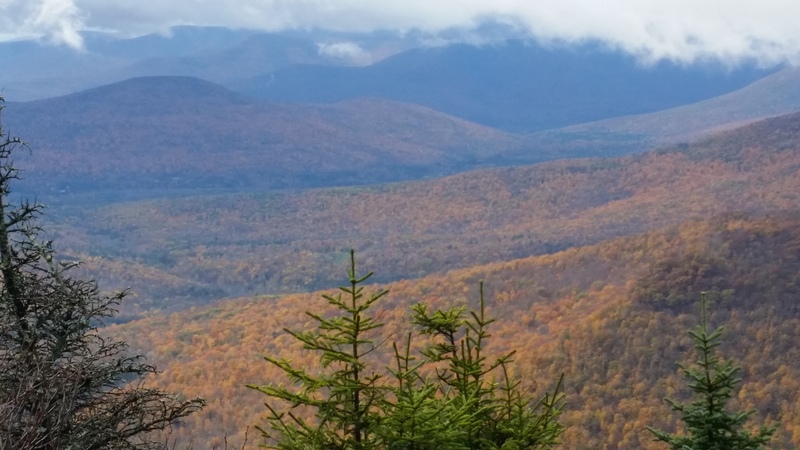 The Shawangunks lie south of the Catskills, and from vantage points in the Gunks (as they are called by locals), I had often gazed north at the the Catskills’ jagged mountain walls, amazed at their rugged mass. 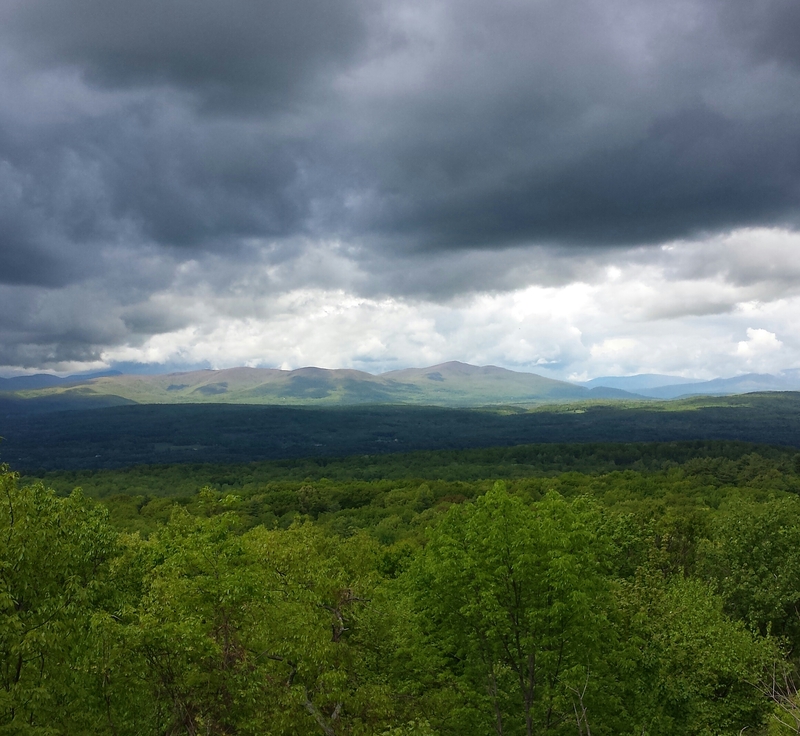 But I had never looked south from the Catskill’s heights and spotted the distinctive ridgeline of the Shawangunks. I had passed over Indian Head while thru-running the Long Path in 2013, but hadn’t looked in the right direction. 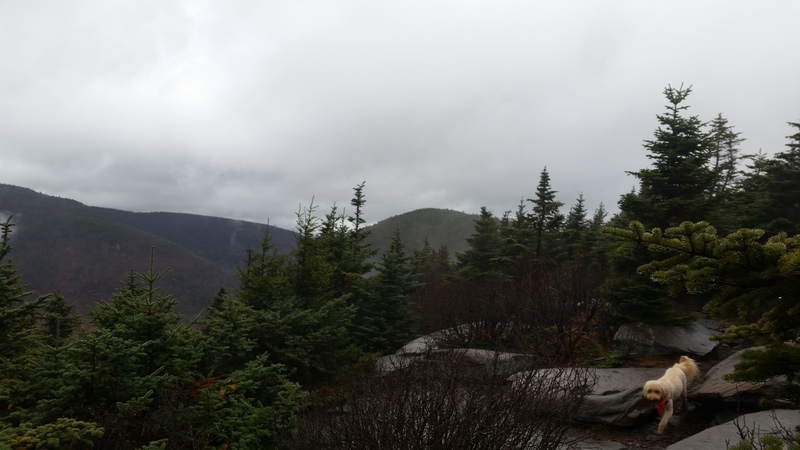 I had come through again earlier this year during Manitou’s Revenge Ultramarathon, but before I reached Indian Head, the clouds had moved in, the mist had turned to rain, and as far as views the trail might as well have been a tunnel. So today, I had this objective firmly in mind, although the weather did not seem propitious. It had rained during the night, and now the mountains were cloaked in fog. Nonetheless, Odie and I headed out with enthusiasm, stepping on wet rocks and splashing through puddles. The trees were still dripping, but the rain had let up, and once or twice the clouds thinned and the sunlight brightened, before the mist rolled back in. 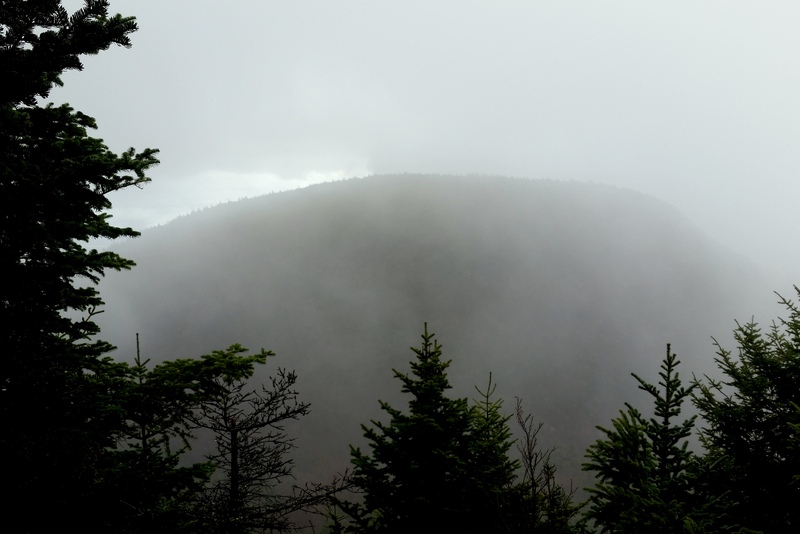 As the path crawled around the eastern shoulder of Indian Head, we glimpsed the neighboring peak, separated from us by swirling fog and a deep notch that glacial melt-waters had worn through the rocks thousands of years ago. After a series of scrambles, the path reached the top of the ridge and leveled off. Odie and I found ourselves high within the clouds, but they were slowly lifting, as if a window had been cracked open. We could pick out a few spots on the valley floor some two thousand feet below. The climb to Indian Head hadn’t been too taxing, so we decided to continue on another mile and a half to the summit of Twin Mountain. We descended into the next notch, stumbling over rock slabs and fragments still wet from the early morning rain. From time to time, Odie would look back, wondering why I was moving so slowly. But soon enough we reached the notch, and then we were heading up once again. 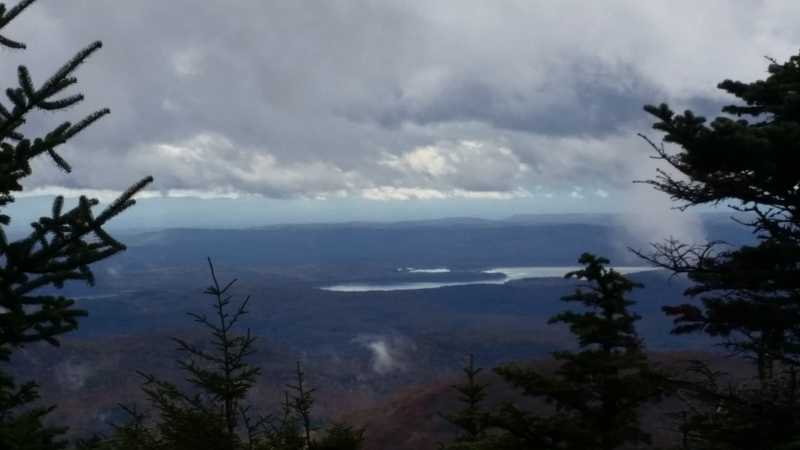 Upon reaching the first vantage point, we looked out at a ceiling of dark clouds — but on the valley floor, the fog had lifted, and the Ashokan Reservoir and the Hudson River gleamed dully in the distance. 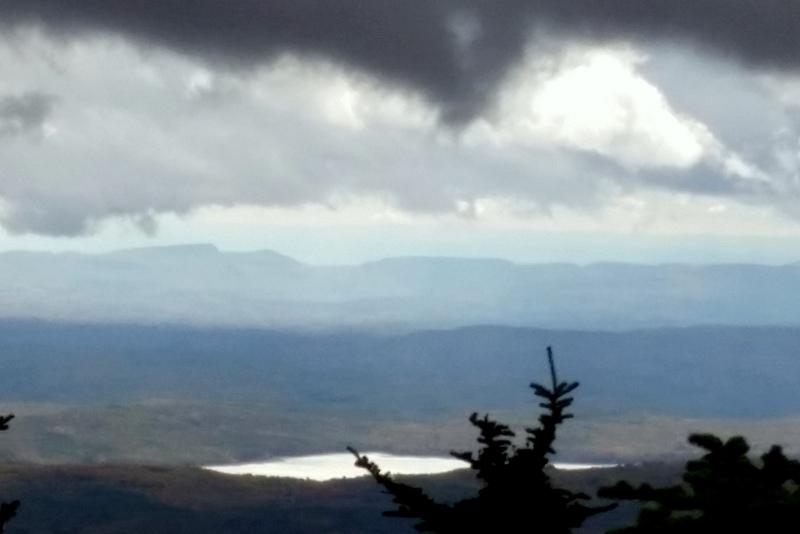 We continued on to the second vantage point on Twin Mountain, and from here, we spied a flash of sunlight off in the distance, where some vortex must have broken the cloud cover. Silhouetted against the horizon was a ridge that seemed to curl and plunge like a breaking wave. On the highest point of this ridge stood a stone tower, just barely visible like the point of a needle. 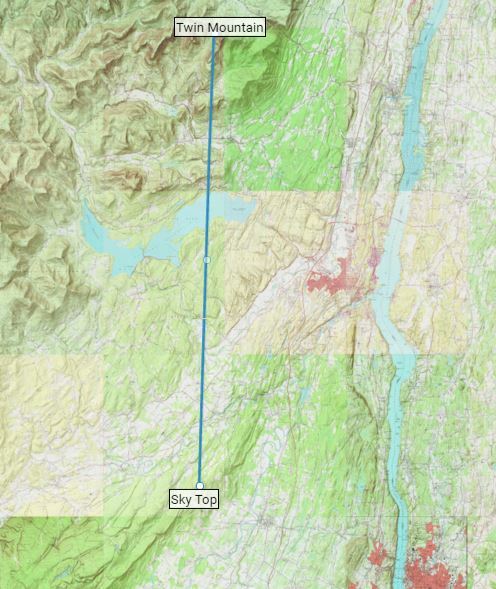 This was Skytop Tower, which stands high in the Shawangunk Mountains. I had finally connected the dots. Pulling out a compass, I shot a magnetic azimuth due south. Once back home, I measured the distance at 25 miles. Sometimes you have to work hard to achieve the visions you seek. Other times, visions appear of their own accord — all you have to do is keep your eyes open. On the way back, flashes of warm yellow light caught my eye through breaks in the fir-spruce thicket. The sun had risen higher in the sky, and it was now beaming down on the eastern-facing slopes of the southern Catskills and lighting up the fall foliage, which was glowing incandescently. Odie and I took a long, rocky trail back to the road. 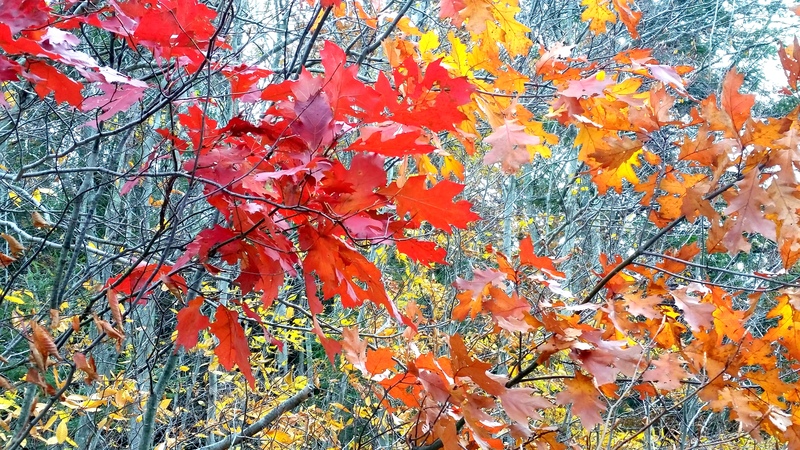 Now that we were down in the valley again, hemmed in by mountain walls, the vistas were gone, but all around us clusters of leaves flickered in the trees: northern red oak flashed a fiery scarlet, while the beech were glowing yellow and tan. On the drive back home, we descended through a steep mountain gorge which had earlier been veiled in mist, but now its slopes caught the sun and flared orange so brightly that I felt we must have momentarily passed into an alternate reality. And then we found ourselves back on the Hudson Valley and proceeded on the highway home. 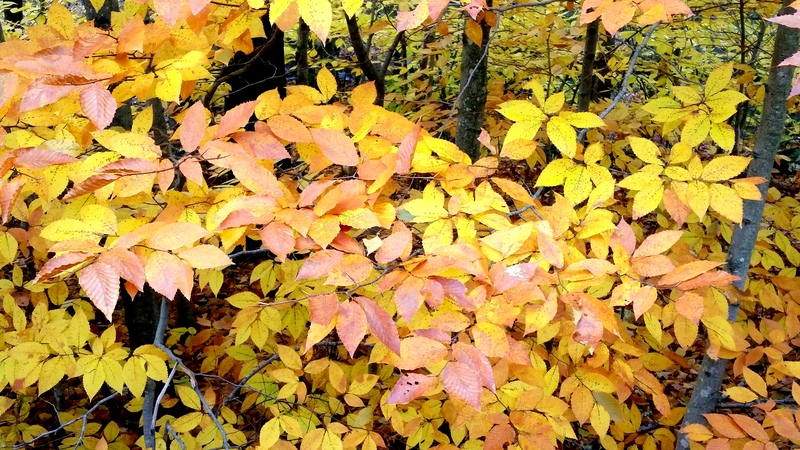 The next time we’re up in the Catskills, the fall foliage will be gone, but I expect there will be other things to see.